Today (October 2nd, 2012) is 143rd Birth Anniversary of Mahatma Gandhi who is known as "Father of India". 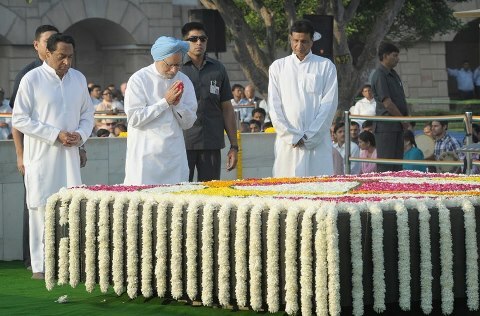 Indian Prime Minister Dr. Manmohan Singh visited Gandhi's memorial at Rajghat to offer floral tributes. India got freedom under the leadership for Mahatma Gandhi. Gandhi fought against the British rulers. 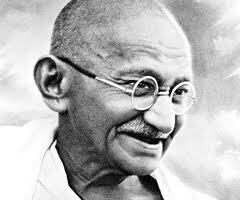 Gandhiji was bom on October 2, 1869 at Porbondar, Gujarath in India as "Mohandas Karamchand Gandhi". In his boyhood, Mohandas was a shy, average type of student. After passing Matriculation examination, he was sent to England for higher study. In England, he lived a simple life. He returned to India as a lawyer. He went to South Africa. He fought for the rights of the people there. He worked to improve the lot of Indian people. After returning to India, Gandhi took part in the freedom movement. He travelled all over the country to study the people of India. He saw poverty and suffering all around. Gandhiji went to jail many times. He followed the principle of truth and ahimsa. Truth and nonviolence were his two great weapons. He worked for Hindu-Muslim unity. Gandhi’s intellectual influence on Indians has been considerable. Some were attracted by his emphasis on political and economic decentralisation, others by his insistence on individual freedom, moral integrity, unity of means and ends, and social service; still others by his satyagraha and political activism. Gandhi’s ideas have also had a profound influence outside India. Prominent among these are Martin Luther King in the United States and, Nelson Mandela in South Africa. Read Mahatma Gandhi Quotes here.